Richard Hoggart, famous for his writings on literature, education, and the means of communication, and especially for his influential book The Uses of Literacy, has written a new work in which he looks at the ways in which mass communications in the twenty-first century both encourage and hinder greater understanding of the modern world. Hoggart takes a number of aspects of mass society today - celebrity worship, youth culture, broadcasting, and a decline in the proper use of language - and considers the paradox that the ready accessibility of information of all types does not automatically lead to greater comprehension of our world. Information itself is inert and only leads to knowledge if it has been ordered and assessed. ;He assesses the slow but uninterrupted dissolution of old beliefs, in particular the widespread corruption of language. He analyses the erosion of the traditional pillars of authority throughout a century and a half of sustained intellectual criticism of existing assumptions and beliefs, especially in the religious sphere. Throughout the book, he examines broadcasting as the prime disseminator of mass information. Hoggart makes an impassioned argument for Public Service Broadcasting in its truest form, and sees the Public Service ideal as coming increasingly under attack from today's BBC broadcasters. People who seem to believe that the overwhelming function of television today is to entertain. - Publisher In his latest book, Richard Hoggart looks at the ways in which mass communications in the twenty-first century both encourage and hinder greater understanding of the modern world. The author takes a number of aspects of mass society today--celebrity worship, youth culture, broadcasting, and a decline in the formal uses of language--and considers the paradox that the ready accessibility of information of all types does not automatically lead to greater comprehension of our world. Information itself, he claims, is inert and only leads to knowledge if it has been ordered and assessed. Also examined thoroughly in this book are the slow, but uninterrupted dissolution of old beliefs, in particular the widespread corruption of language, and the erosion of traditional pillars of authority as a result of century and a half of sustained intellectual criticism of existing assumptions and beliefs, especially in the religious sphere. Throughout the book, Hoggart examines broadcasting as the prime disseminator of mass information. He makes an impassioned argument for Public Service Broadcasting in its truest form, which he sees as coming increasingly under attack from today's BBC broadcasters and a widening public who view entertainment as the primary function of television today. - Publisher Richard Hoggart looks at the ways in which mass communication in the twenty-first century both encourage and hinder greater understanding of the modern world. Taking a number of aspects of mass society today - celebrity worship, youth culture, broadcasting, and a decline in the proper use of language - Hoggart considers the paradox that the ready accessibility of information of all types does not automatically lead to greater comprehension of our world. 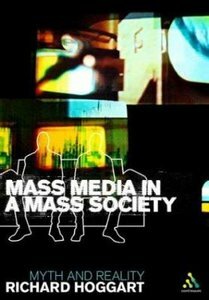 About "Mass Media in a Mass Society"
In his latest book, Richard Hoggart looks at the ways in which mass communications in the twenty-first century both encourage and hinder greater understanding of the modern world. The author takes a number of aspects of mass society today--celebrity worship, youth culture, broadcasting, and a decline in the formal uses of language--and considers the paradox that the ready accessibility of information of all types does not automatically lead to greater comprehension of our world. Information itself, he claims, is inert and only leads to knowledge if it has been ordered and assessed. Also examined thoroughly in this book are the slow, but uninterrupted dissolution of old beliefs, in particular the widespread corruption of language, and the erosion of traditional pillars of authority as a result of century and a half of sustained intellectual criticism of existing assumptions and beliefs, especially in the religious sphere. Throughout the book, Hoggart examines broadcasting as the prime disseminator of mass information. He makes an impassioned argument for Public Service Broadcasting in its truest form, which he sees as coming increasingly under attack from today's BBC broadcasters and a widening public who view entertainment as the primary function of television today. Richard Hoggart looks at the ways in which mass communication in the twenty-first century both encourage and hinder greater understanding of the modern world. Taking a number of aspects of mass society today - celebrity worship, youth culture, broadcasting, and a decline in the proper use of language - Hoggart considers the paradox that the ready accessibility of information of all types does not automatically lead to greater comprehension of our world. Richard Hoggart was educated at Leeds University. Later as professor of modern English literature at Birmingham University, he founded the Centre for Contemporary Cultural Studies.